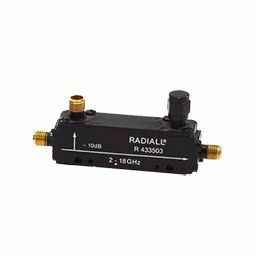 Radiall's directional couplers are designed for systems applications requiring external leveling, precise monitoring, signal mixing, swept transmission and reflection measurements. Our offer includes broadband products from 0,15 GHz to 18 GHz with low VSWR and insertion loss, available with all standard coupling values : 3, 6, 10, 20 & 30 dB. Radiall directional couplers are designed and tested as per MIL-STD-202 standard.